The Year of the Rooster on January 28th is the start of the Chinese New Year. The energy influences for 2017 are Yin Fire over Metal, metal being the rooster’s element/energy. Fire and Metal clash, and the 2016 yang fire and metal monkey clash brought the energy of unpredictability and surprises, taking a risk and trying something different. 2017 yin fire and metal rooster energy gives us a wake-up call to get moving, but in a more calculated, methodical and practical manner. 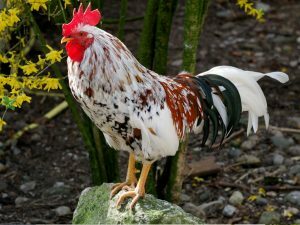 Rooster energy gives a sense of optimism, strength, leadership, collaboration and communication, while the yin fire kindles around it, gathering heat until, at the right time, it turns into a roaring fire. The Rooster provides us with a perfect energy this year for taking responsibility for our direction in life, thinking out what we really want, and planning how to achieve it. Then the Rooster treads along confidently and optimistically, taking slow but sure steps, while the yin fire glows around our plans, gathering heat, until it finally ignites them into achievement. Last year I grabbed the Monkey energy and stepped into the unknown. It brought me a different perspective, new ideas and new contacts. It was like a breath of fresh air. This year I’m definitely going to do some thinking and planning, and move ahead optimistically, waiting for the yin fire to start glowing bright and strong.